Bok-Hee (Jang Mi In Nae) is a girl who studies very hard and works at a brewery. When she was 5-years-old, her parents' divorced and Bok-Hee then lived with her mother. Her father died in a coal mine accident. Bok-Hee came to brewery company Dukchun with her younger stepbrother after her mother married Song Byung-Man, the owner of Dukchun. Bok-Hee addresses her mother as "aunt," to avoid getting her mother into trouble. Finally, people learn that Bok-Hee is the daughter. Her stepbrother is sent off to an orphanage and Bok-Hee leaves for Seoul. Joon-Mo (Ryu Tae-Joon) worked as a stuntman, but due to injury had to quit his job and come to Dukchun to work as a temporary teacher. Joon-Mo meets Bok-Hee for the first time when she peers through a classroom window in which he teaches. Joon-Mo sees the passion in her eyes and becomes her mentor. 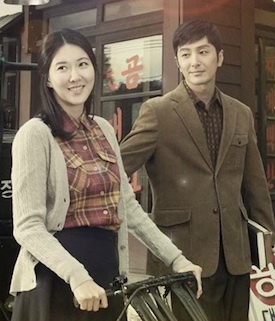 "TV Novel: Dear My Sister" takes over the KBS2 weekdays 09:20 time slot previously occupied by "Pit-a-pat, My Love" and followed by "TV Novel: Love, My Love" on May 7, 2012. Clare Fagan Apr 23 2014 8:09 pm I just started watching Korean Dramas, and I love, love, love them!!! The best part of my day is when "Bok Hee" comes on! I would love to see a continuation of Bok Hee with the same cast of actors and actresses! squidoo.com Jan 20 2014 7:48 pm Article Source: you looking for more information regarding business gifts for men. College students usually remember to take their razors, shampoo, and soap, but will they remember some of these other essential things. A gift is the best way to see an instant smile on the face of any person whether young or old. stone May 23 2012 8:19 am yes i was watching so happily then last two episodes not telecast, why ??? supriya May 21 2012 11:37 pm someone please tell me is "dear my sister" over...i have been watch it mon-fri at 11...but its not telecasted from may 21st...i am really missing watching it...please tell me what is its new timings ????????????????????????????????????????? FGSJunior May 18 2012 8:58 pm Seriously where can I watch the last episode? I didnt got the chance to watch episode 130.
sujubloom May 10 2012 5:57 am hi everyone! please update me about this drama.. the last time i watch was when bokhui is trying to save the winery.. what happened to every character especially young pyo and geumju? our kbs channel has been moved to digital cable so i can no longer watched this as well as my other favorite shows such as 2 days and 1 night and musicbank.. so sad :( thanks for future reply..
Pat McClenton May 03 2012 9:59 am I love Korean dramas! Now I can understand them with the English sub-titles. Great story lines. Oh, how I wish they were on for a longer time period - like an hour! loudette Apr 30 2012 9:19 am ...nice drama...I love watching this drama because of Yeongpyo and Geumju...hope Bokhui ends up with Mr Hong and not pathetic Mr. Kang who spoils his stepdaughter...Mr. Kang should end up with the "puppy" nurse as she's willing to look after the spoiled stepdaughter... Hoping dear my sister will have a happy ending...Geumju marrying Yeongpyo upon her return from France. Donna Apr 19 2012 8:01 pm I have been watching Korean dramas for about three years and I want to say this is not only a slow starter but one of the worse dramas I've seen so far. Mufaaz yousuf sheikh Apr 19 2012 10:49 am I am from Kashmir I do not know about Korean language.Thanks to channel we are able to watch and love Korean channel. About Dear my sister is the best and great drama.Please continu it FOREVER we will love to watch it till the end of world . I have two sisters in drama and mr and mrs kana .That means their acting is superb.About BOkhia she is tremendous I wish I would have that type of attitude GREAT WORK!!!!!!!!!!! Iris Apr 04 2012 8:19 pm Geumju's just horrible, who cares if she's pretty. Call me crazy but Bokhui and Yeongpyo would be so much better together. watchumlots Feb 23 2012 2:10 pm This drama is available on MVIBO for a fee, they have just posted episode 80, English subtitles up to episode 29 (as of Feb 23). Ruth Feb 20 2012 4:49 pm I like this drama. Cleo Feb 17 2012 6:17 am Im not an early bird by far...but I get up every mornin @6:20am(since the time slot changed) religiously to watch this korean drama...im half korean so korean drama is nothin new to me but this korean drama leaves me wantin to see more all the time..I CANT WAIT TIL MONDAY...LOL!!! 6teen Feb 16 2012 1:58 pm what's the name of the opening theme? Helen Feb 15 2012 9:04 am Looking forward to watching this drama again. Helen Feb 15 2012 9:04 am I have watched this drama series since it started but for the past 3 days I wasn't able to watch it since you changed the time slot. I really love this drama novel.Are there any replays. Pls. update I love all the characters especially Boknam he's so cute. Thank you Kamsamnidah. Hussain Isa Feb 11 2012 8:49 am Thk langsircoklat. But without english sub, i may not know the storyline..... N i may end up fruztrated. langsircoklat Feb 10 2012 4:08 am to cristine..hv u try at asiandramadownloads.com? langsircoklat Feb 09 2012 6:27 am never miss every episode..yeah!! the main reason i keep watching this drama because of youngpyo and geumju..i hope they will be together..everytime i see geumju with that japanese man..i feel like ********** !! oh god..youngpyo is so handsome..and geumju so beautiful!! credit to dalbong and his wife..so funny!! Hussain Isa Feb 07 2012 9:52 am I've been watching the show until recently, where I've to start work. Thus, it cos me lot of heartache. So may i know where I can watch episode 56 onward. It has great storyline, simple n easy to understand. Plus the acting by all the actors n actressess are good. Keep it up guys. Darlene Jan 25 2012 12:53 pm I am horrified by the way the grandmother is abusive as well as the young girls in the family. Is this a true depiction of the Korean family? sujubloom Dec 26 2011 8:42 pm ..Im so loving this classic drama since the beggining! chealsea Dec 22 2011 12:08 am May I know the childhood/kid casts?